There are several sites out there where prolific programmers challenge themselves to release large numbers of games over very short periods of time, often as frequently as a new game every week, or every month. But you never get to see behind the curtain; see how the games are actually created and assembled, how they evolve on a day-to-day basis. Enter VectorStorm, a day by day chronicle of my game development activities. For the programmers out there, VectorStorm is designed to be a framework inside which one can quickly prototype games. 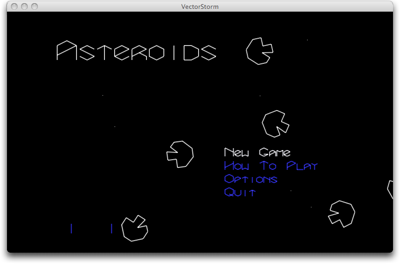 By focusing on 2D games using simple vector graphics, VectorStorm tries to remove the “but I can’t draw” sticking point that stops so many capable programmers from ever attempting to make a game. Most games are open source, with code available under the GPLv3, and data files under licenses which permit non-commercial redistribution, and implemented using SDL and OpenGL. The engine itself is released under the terms of the zlib license, so feel free to use it for commercial/proprietary purposes if you like. It will compile and run under Windows, Macintosh, Linux, or virtually any other operating system you’d like to throw at it. Check the links in the sidebar to pre-built binaries of VectorStorm releases, to its public Github repository, and to further news updates about its development. Hope you enjoy your time here!